The Art Factory is starting a trolley service with two cars that will cover the Great Falls and key buildings in the downtown Paterson business district. Service will start later this month, said David Garsia, owner of the Art Factory. He said the two cars – a 22-seater and a 32-seater – will take visitors from the Art Factory on Spruce Street to the historic Passaic County Courthouse, the Paterson Train Station, the Passaic County Community College, the Robert A. Roe Federal Building, the Great Falls, City Hall, downtown shopping district, and the Ellison Street parking garage in two loops. “We’ll run them as long as there are visitors,” said Garsia. 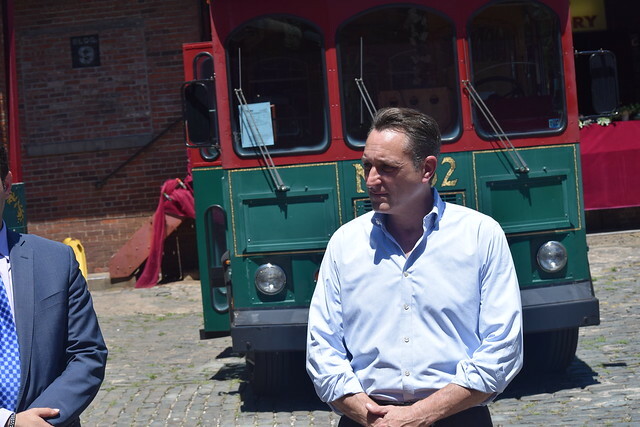 His company spent $100,000 to acquire the two trolley cars, he said. He did not have a figure for operations cost. Rides will be free for visitors. 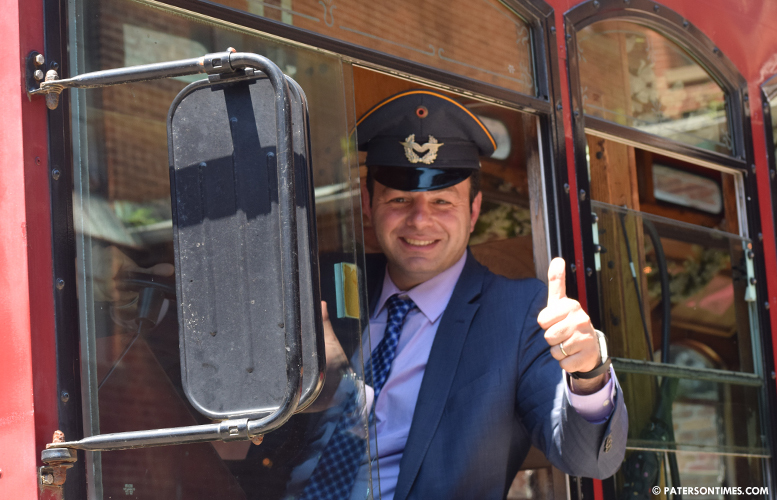 The trolley service comes at a time when a new mayor, Andre Sayegh, is trying to rebrand a city that is mostly known for crime and corruption through tourism. “We’re trying to drive up tourism in this city,” said Sayegh, who got into the driver’s seat of the smaller car, wearing a trolley captain’s hat, to simulate driving the vehicle, at the Art Factory on Tuesday afternoon. He proposed creating a Paterson Tourism Office, something the city had decades ago, to promote the city to visitors. The city has had little success in turning visitors to the Great Falls into customers for local businesses. But that could change. “If I have a trolley coming right into the brand-new Overlook Park starting in September, and I can tell visitors you can get on there and you can see all these other cultural destinations in and around the city, I think we have a great way to really connect what you’re doing at the Art Factory and what we’ve been doing at the Great Falls,” said Darren Boch, superintendent of the Great Falls National Park. Boch said visitors feel uneasy venturing beyond the vicinity of the Great Falls. Downtown Paterson, a safe walk down the McBride Avenue extension, appears miles away. Market Street, known for having some of best Peruvian eateries in New Jersey, only a block away from the Great Falls, is a long journey for some uneasy visitors. Garsia needed to establish a trolley service to take visitors and tenants of his huge art complex to the garage on Ellison Street. He had to make up for lack of parking at his complex by connecting to the parking garage. Next year, the Paterson Parking Authority plans to deploy a single trolley car to connect the Great Falls to the South Paterson commercial area, filled with ethnic restaurants, mostly serving the in vogue Middle Eastern cuisine. The Paterson Parking Authority had trolley cars that offered free rides to shoppers until 2012, when a budget crunch killed the service. wow!!! a Trolley service. the Art Factory must have settled all the Violations it has against it. or someone started receiving their monthly kickbacks 'again' to look the other way.